I made this card for the current CAS-ual Fridays Challenge - to use scallops on your card. I bought this stamp set a long time ago and have never used it, so I thought I would ink it up for this one. Originally, in my mind I wanted the card to be aqua, but I couldn't find a color I liked so I found this piece of Whipped Mousse and thought it would work. Thanks for taking a look!! lovely stamp and such an elegant card! Super sweet CAS design Donna! Such a beautiful sentiment too! I like the simplicity of this, Donna. With that big sentiment, the card is complete! Fabulously clean and simple, and a very lovely card. 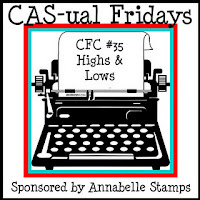 Thanks for joining us over at CAS-ual Fridays! So elegant :) Love the rich color. Thanks for playing with us at CAS-ual Fridays!